Lightning is one of the most enigmatic natural phenomena, and scientists still don't entirely understand it. But that's not stopping them from putting it to use. If scientists knew, in 1752, what they know now, Benjamin Franklin may never have ventured out into the storm. 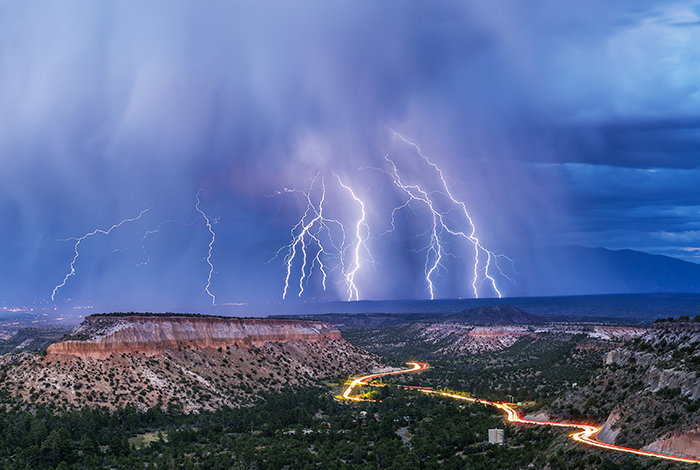 Lightning happens when electrons flow momentarily between charged layers of clouds or between clouds and the ground. A lightning flash is accompanied by intense heat and all manner of electromagnetic emissions, which can be measured to help understand the phenomenon. Los Alamos scientists are studying lightning for a variety of purposes: as a natural proxy for atmospheric nuclear explosions, as a radar system for ionosphere perturbations, and as a monitor for volcanic eruption. Also under their scrutiny is the very cause of lightning itself, the source of the spark that sets the rest in motion. View our publications on desktop, tablet, mobile and other portable devices.